Guitar tablature, usually referred to as “tab”, is a method of notating music that empowers beginner guitarists to learn songs quickly and easily. Guitar tabs share similarities with music staff notation by showing you what notes to play, how long to play them, and what techniques to use. But when compared to standard music notation, guitar tablature offers a serious advantage: it shows you where to play the notes on your guitar. 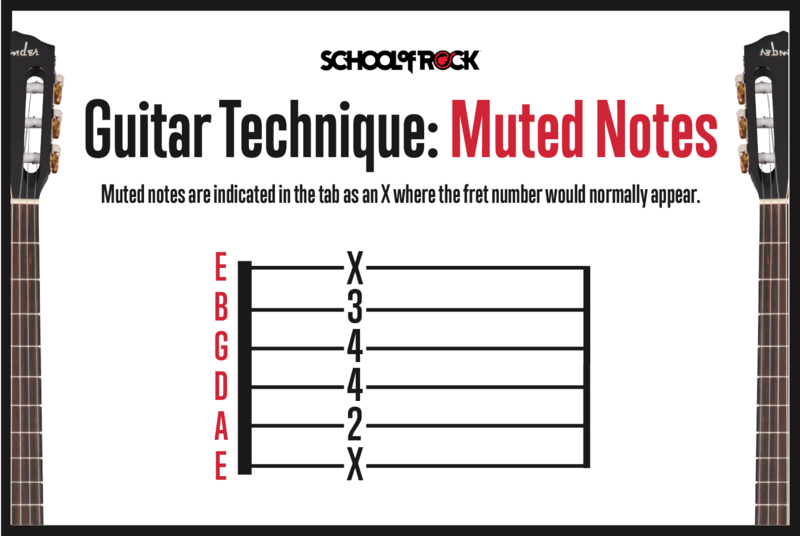 This comes in handy, especially since the guitar has many different places to play the same notes. For this reason, understanding guitar tablature is particularly useful for beginners, and allows students to learn how to play the guitar without ever having to learn how to read traditional musical notation. 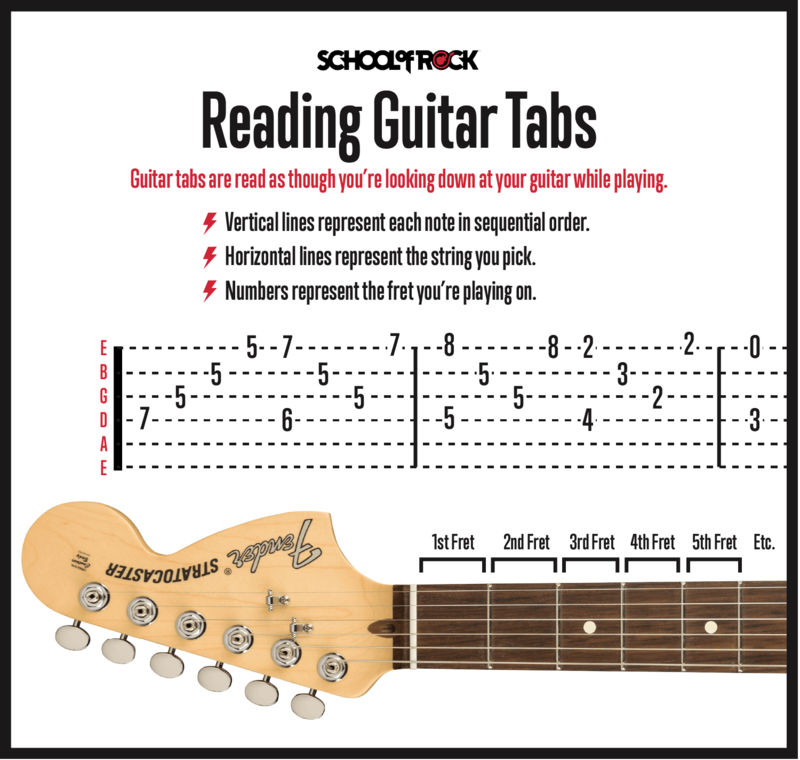 At School of Rock, we teach students how to read guitar tablature since it can show you both chords and single notes –– making it the fastest way to learn your favorite songs. It can also be an easier way to learn, since knowing how to read guitar tabs doesn’t require any special knowledge other than locating the strings and the frets on your guitar. If you’re ready to learn about what guitar tabs are and what they can be used for, you’ve come to the right place. Let’s get started. Guitar tablature is the visual representation of the notes in a song. Standard guitar tab consists of six horizontal lines, with each line representing the six strings on the guitar. When looking at guitar tab from top to bottom, the top line represents the high E string (the thinnest string) followed by lines that represent the B, G, D, A and low E strings (the thickest string). This also reflects the view of the strings as you look down while holding your guitar. For this reason, think of guitar tablature as your roadmap, for it will provide you with the fastest route to learning songs. On each line of tab you will also see numbers. These numbers represent the frets on your guitar, which are the metal strips found on the fretboard. The frets are numbered 0-24, and start at the nut (the piece closest to the headstock), and run the entire length of the guitar neck. For example, if the string has a 0, that means you play that string “open,” or without using your fretting hand. If the string has a 1, then that means you must play using the first fret. When learning how to read guitar tabs, it’s important to understand that 1 represents the first fret, 2 the second fret, 3 the third fret, and so on. Guitar tab is read left to right, and all notes indicated are in chronological order. When the numbers are in line with each other vertically, they represent a chord. A chord is played by strumming all the indicated strings at the same time. Guitar tab notation is better for the beginner than standard notation, for it tells you what notes to play to make the chord and where you can find them on your guitar. What do I need to know to read guitar tabs? For beginners to read guitar tab successfully, they must familiarize themselves with the 6 strings and the locations of the various frets. This will allow them to locate the proper notes to play while using the guitar tab as a guide. The guitar tab staff looks similar to the staff used in standard notation. One major difference is that the staff lines in guitar tab represent the 6 strings, not the actual notes. The top line represents the high E string and the bottom line represents the low E string. 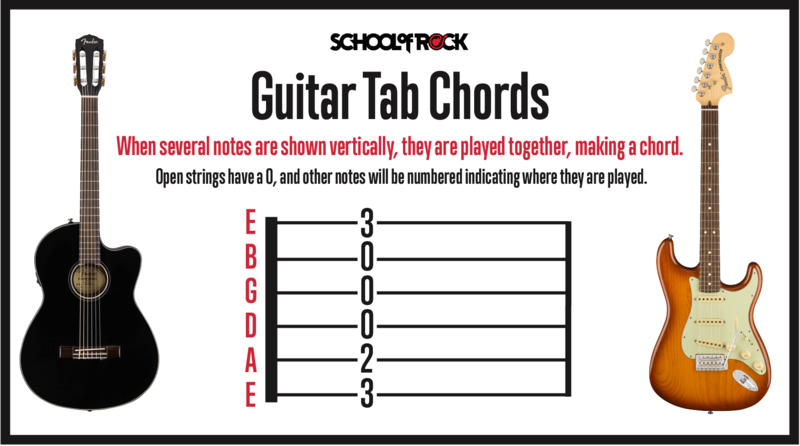 This makes playing guitar tab easy for beginners, and the staff will also be labeled “TAB” so it’s not confused with standard notation. The guitar frets are the metal strips that run across the fretboard. Most guitars will have 19-24 frets. Each fret is one note or a half step from the other (which can also be referred to as a semitone). There are 12 notes (or frets) in each octave, and most guitars have fret markers on the side of the neck or on the fretboard. These markers are typically at the 3rd, 5th, 7th, 9th and 12 frets, and can help you easily recognize the fret positions when playing. Remember: when looking at guitar strings, fretted strings are indicated by numbers, and open strings are indicated by the number “0”. This shows you to play the string “open” without using your fretting hand. You simply pick or pluck the string and let it sound. While chords do not have any special symbols in guitar tab, they can be identified easily by their position. When several notes are shown to line up vertically, they are played together making a chord. If a chord is arpeggiated, it will appear as single notes even though you are fretting a chord. Many Rock songs consist of “riffs”. Riffs are usually a combination of single notes and partial chords (such as power chords). For riffs, the general rules of guitar tab apply: when two or more notes line up vertically, play them at the same time. Guitar tab differs from a standard chord chart in a few ways. A chord chart is a diagram showing where to fret each string to make a chord, and it also tells you which finger to use. A chord chart can be included in guitar tab, and is usually positioned over the lyrics of the song to indicate when the chords are changed. Chord charts only show the 3 to 4 unique notes that make up the specific chord. But an accurate version of the song may require single notes, notes not in the root chord, or arpeggios (the pattern used to play the individual notes within a chord) that are not indicated. For this reason, chord charts are often featured along with guitar tab to help beginning guitarists understand how to move beyond the basic chords to play a song. Tablature is linear, but chord charts are like a snapshot of your fretboard. As such, chord charts use a numbering system that indicates which fingers to use when playing. The fingers of the “fretting” hand (the hand that pushes the strings down on the fretboard) are numbered. For example, the index finger is 1, the middle finger is 2, the ring finger is 3, and the pinky is 4. This differs from tab, as the numbers used in guitar tab will indicate which fret to play, and not which finger to use. For this reason, chord charts can be included in guitar tabs to show beginners how to position their hands while playing. Our music programs are taught by practicing musicians with the experience you need to learn to play. Perform live shows and develop your skills in a supportive learning environment for all skill levels. Besides lines and numbers, guitar tab can contain different symbols that indicate when to play a specific technique. Learning how to read guitar tab symbols and how to apply them will make your playing sound much more authentic, and make reading guitar tab easy. Before playing, always make sure to check your guitar tuning and adjust your pitch, or your guitar won't sound right. Muting is an important technique in Rock music. Many styles of music, including Heavy Metal, Punk and Alternative rely on different muting techniques to give the music a certain sound or character. While done predominantly with your picking hand, muting can be done with either hand or with both. Muting notes adds dynamic to your playing and is a valuable tool for making you sound more polished. In many songs, the verses may be muted while the chorus or hook is not. When playing, most guitarists employ muting techniques all the time without even thinking about it. When playing at stage volume, muting keeps you from having unwanted noise or even feedback as you play. Palm muting is one of the most used techniques in Rock guitar. It is accomplished by having the palm of your picking hand in contact with the strings as you pick them. Heavy palm muting produces a tight rhythmic sound, while light palm muting lets the notes ring out a little more. 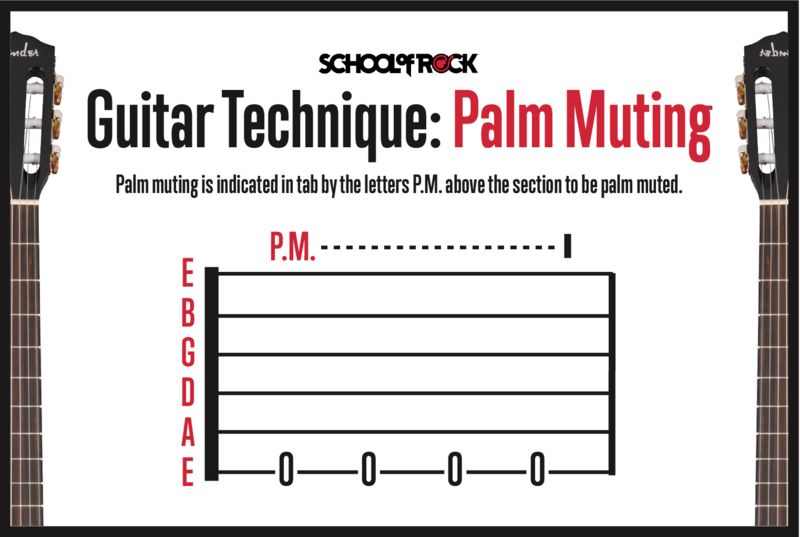 Beginners reading guitar music should look for the letters “P.M.” above the section that needs to be palm muted. Muting notes is a different technique than palm muting, and it is accomplished using your fretting hand. In guitar tab, the notes are still picked, but they are not clearly sounded as the fretting hand does not press the note all the way down on the fretboard. In guitar tablature, this is indicated as an X where the fret number would normally appear. 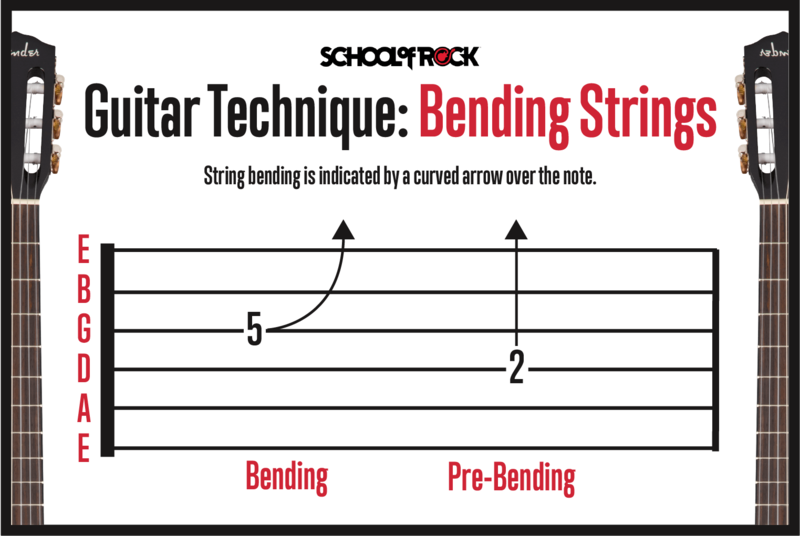 Bending strings gives your guitar playing an expressive, vocal quality. To locate bending in guitar tab, beginners should look for a curved arrow over the note they want to play. This will make the pitch of the string go higher. The arrow may indicate a ½ or full step; this is telling you to make the string a ½ step (one note) or full step (two notes) higher in pitch. These notes are often referred to as “target” notes. Bending is accomplished by pushing the strings up or down rather than just pressing straight down on the fretboard. For all the strings but the low E, most players push the strings up towards the ceiling, the low E must be pushed down toward the floor. The trick is to maintain even constant pressure on the string as you bend it. Most bends are done using 2 or 3 fingers: the “main” fretting finger (usually the ring finger), and the middle and index fingers for adding support and strength. This will make bending smoother, easier, and adds control to the pitch of the note. When reading guitar tab, beginners might also encounter what’s called a “pre-bend.” In a pre-bend, strings can be “pre-bent” and then picked and released to return to the original pitch of the fretted note. This will be indicated by an arrow going straight up with the range of the bend (full, ½. etc.) shown followed by a curved arrow going down. Pre-bent notes may return down to the original note or bent even higher up to another target note. Sliding is another useful technique; you can slide up or down to the next note. This is different than bending, you will actually slide your fretting finger up or down to the desired fret. When sliding up, it will be indicated by a line between the note you are sliding from to the note you are sliding to. 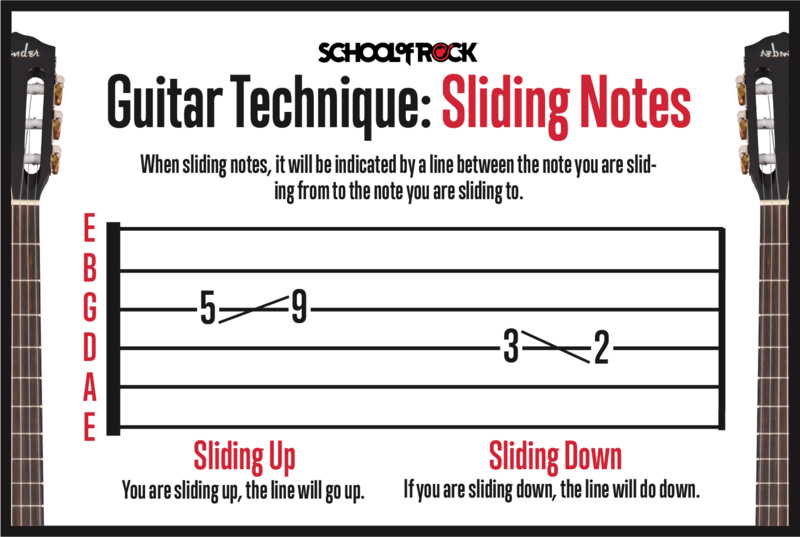 If the note you are sliding to is higher, the line will go slightly up. Conversely, when sliding down, it will be indicated by a line between the note you are sliding from to the note you are sliding to. If the note you are sliding to is lower, the line will go slightly down. The hammer-on is a cool technique where you don’t pick the note but you “hammer on” the note with your fretting finger. You can hammer on from an open note or a fretted note, and the resulting note will be higher. 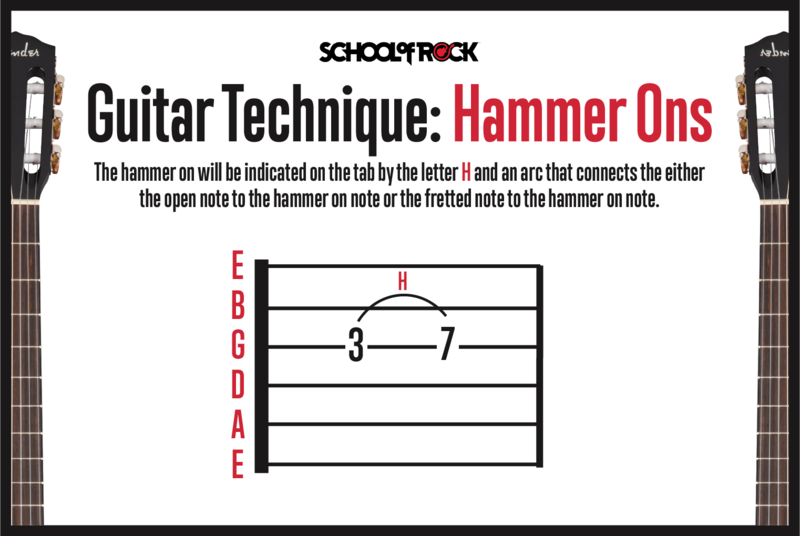 The hammer on will be indicated on the guitar tab by the letter “H” and an arc that connects either the open note to the hammer on note, or the fretted note to the hammer on note. To play a hammer on, strike the string with the fretting finger with enough force to sound the note. This will take a little practice to produce a clear, strong note. It is also easier to play on the electric guitar with a decent amount of volume. Start with your open low E string, and hammer on to the third fret and hold the note to let it ring. Repeat this on different strings and different frets. Pull offs are the exact opposite of the hammer on. Instead of pushing down on the string, you pull off the string to an open note or a note you are fretting with another finger. These are indicated in the guitar tab with the letter “P” and an arc connecting the pulled off note to the open note, or the pulled off note to the fretted note. The resulting note will be lower. To execute the pull off, you will press the note down and then pull off the note to play either an open or fretted note that is lower. 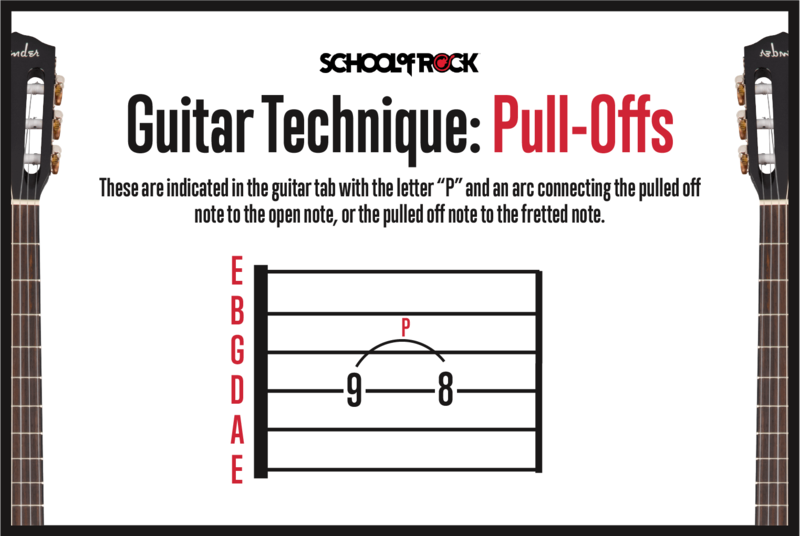 When playing pull-offs on the guitar, you are “grabbing” enough of the string with you fingertip to make the note sound. You can then combine the two techniques to play a combination of both hammer ons and pull offs by repeating the two motions in an alternating fashion. This is sometimes also referred to as a “trill”. Vibrato is the technique of repeatedly bending a note and returning to the original pitch without releasing the note. This produces an expressive note and tone, and vibrato is indicated in tab as a zig-zag line above the staff. 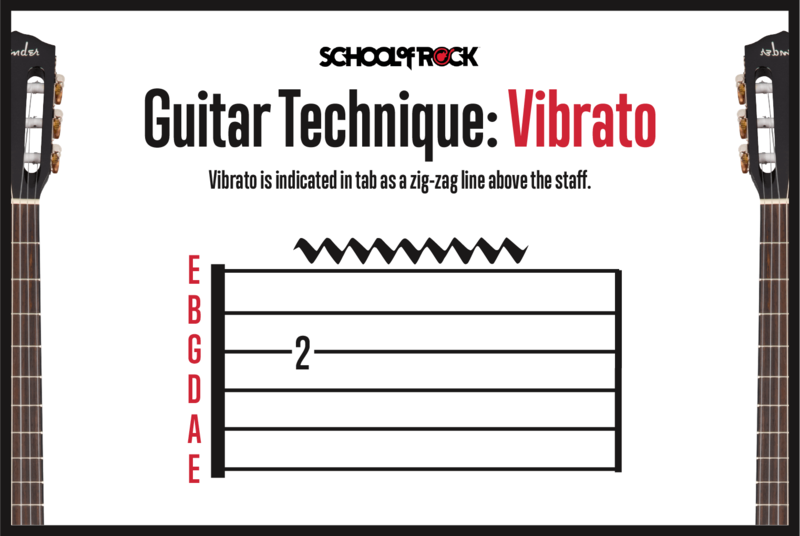 When reading guitar tablature, beginners should look at the length of the line for the vibrato. In general, the longer the line, the longer you should apply the vibrato. Vibrato is very similar to bending, but it is not changing the pitch as much. You can add vibrato using a single finger, or by using a main finger with other fingers as support. Start with a smooth, slow vibrato, and vary the speed for different effects. Like bending, vibrato adds a vocal quality to soloing, and no two guitarist’s vibratos are exactly the same: they are as individual as a fingerprint. Tapping is a popular technique that involves fretting notes with your regular fretting hand while also “tapping” or fretting notes with the index finger of your picking hand. The tapping of your picking hand is a variation of a hammer on. 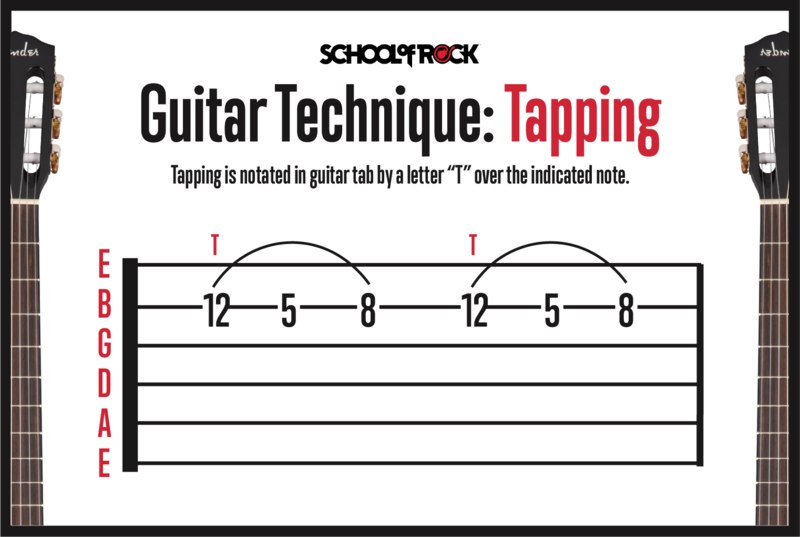 Tapping is notated in guitar tab by a letter “T” over the indicated note. Tapping was popularized by Eddie Van Halen, but the technique has been used in classical guitar for decades. 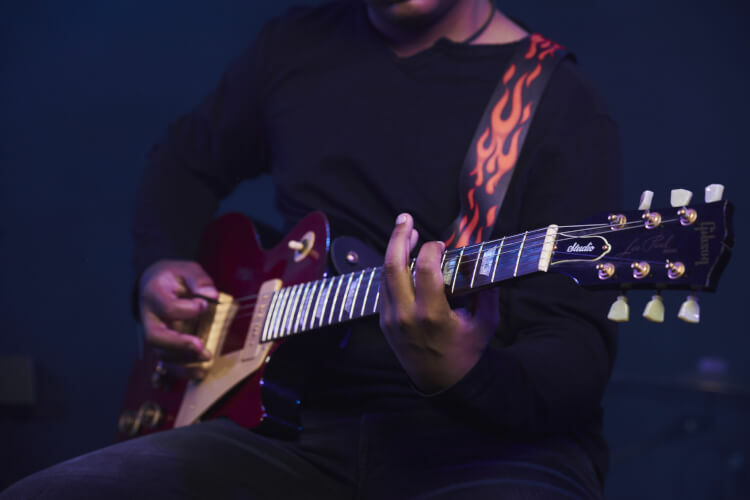 To finger tap on the guitar, fret a note with your “regular” fretting hand and “tap” a higher note on the same string with your index finger on your picking hand. Finger tapping is very similar to the hammer on technique, but instead of your fretting hand, you are using your picking hand. This allows you to play the notes with wide intervals that you cannot reach with just your fretting hand. Playing with a decent amount of gain and volume will also make this technique easier and sound better. It also allows you to play very quickly since you are fretting notes with both hands. Two handed tapping is as the name implies: a technique where both hands will play notes independently without actually picking the notes. To achieve this, both the fretting and picking hands hammer on notes. This is sometimes done with the fretting hand tapping the bass notes and the picking hand tapping the melody or solo notes. 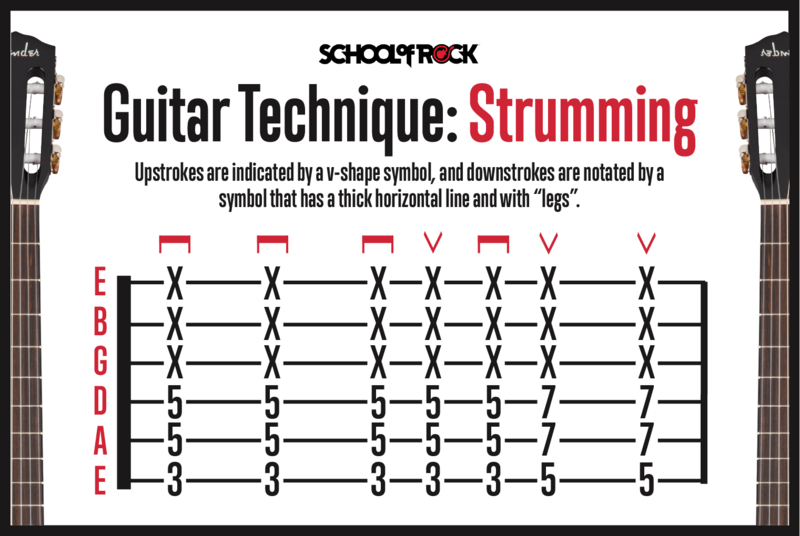 When strumming chords on your guitar, there are two types of strokes used: upstrokes and downstrokes. Downstrokes start on the lower strings of the guitar and end with the higher strings while using a downward motion. In guitar tab, downstrokes are indicated by a symbol that has a thick horizontal line with two “legs” pointing down on both sides. Upstrokes are the opposite and start on the high strings and end on the low strings using an upward motion. In guitar tab, upstrokes are notated by a “V” shaped symbol. When playing chords on a guitar, various strumming patterns are used depending on the rhythm of the song. You can strum in a constant downstroke and upstroke pattern, or in any combination. Songs with an ⅛ note rhythm are counted as: “one, and, two, and, three, and, four, and, one, and, two, and, three, and, four, and...” Many songs use alternating upstrokes and downstrokes in an ⅛ note rhythm with the downstrokes on the 1, 2, 3, 4 and the upstrokes on the “ands”. When playing single notes in guitar tab, the same notation of upstrokes and downstrokes apply. Your pick will go downward as you pick the note, and are indicated by the thick horizontal bar with “legs” pointing down on both sides. Conversely, upstrokes are played with an upward motion of the pick, and are notated with a V above the note to be played. Ready to learn other guitar techniques? Now that you know how to read guitar tabs and what guitar techniques you can play, you’re ready to start playing. From beginner to advanced, School of Rock has taught thousands of students how to play guitar and achieve their full potential. From strumming to tapping, our instructors have the knowledge and experience to have you quickly playing your favorite Rock songs on stage. Ready to look for guitar tabs? From easy songs for beginners to fast-paced pieces for experienced musicians, School of Rock has our students covered. With a vast catalog of high-quality sheet music to choose from, our students can get unlimited access to our growing library at Sheet Music Direct.